As we come to the end of the school year I’ve been reflecting on how much the school impacts successful bilingual development. Most schools are not “bilingual” schools, or “immersion” schools, or indeed any kind of language-based school model. Many schools believe that their only job is to ensure that all their pupils master the language of the school, which therefore absolves them from any need to support multilingualism or the development of their pupils’ “other” languages. This, despite the fact that research clearly demonstrates that the pathway to success in a new language at school is best achieved through supporting the first/home language. After more than 20 years (yes, I am that old…) working in the field of education and language-education, I’ve seen many good models of bilingualism in education, and some poor models too. What I have seen this year, for the first time, is the immense impact that the school can have on “later bilinguals”. We all know that children who start school in a new language at a very young age (pre-school to school age) are generally very successful and seem to acquire the school language quickly. Older children, however, these “late bilinguals” are children who switch schools to a new language after about 7-8 years of age. The transition for these children is generally much more difficult, as the academic weight of schooling increases with age, therefore the language level necessary to learn well also increases. The children pictured above are from my older daughter’s class. They all started Year 5 (final year of primary school) in September, in a new school, and most of them in a new language. The children in the class were almost exclusively monolingual – French, Italian, Spanish, German, Polish, Urdu, Portuguese, and Russian speaking. 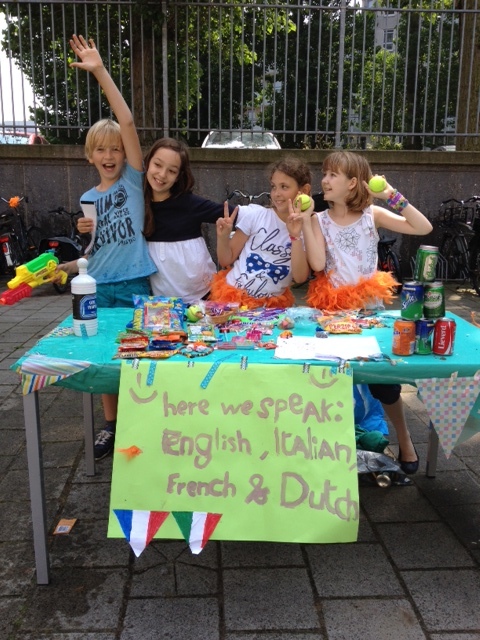 Some of them “had a little English” or “had a little Dutch”, but there were only two children in the class who were truly at ease in English and one other language. The photo was taken last week, at their end of year fair. I chose this photo to represent the growth of the class because it captures perfectly my message today. When children are encouraged to celebrate *all* their languages, they grow in ways we, as parents and teachers, can not begin to imagine. Yesterday we attended the “leaving ceremony” for the Year 5 pupils, and it was another example of the power of positive/additive bilingualism. The children from the Dutch section performed a play in which they traveled through different countries and used Dutch, English, French, German and Spanish in their performance. I’m sure that many parents did not understand all of the play, but the kids did, and they all celebrated each other’s languages by integrating them all into the play. The English section performed a play in which they reflected on their process of starting as a group of diverse children who could not communicate and ending as a cohesive group of children who can all work and play together. 1. Embrace all the languages spoken in the school, both in word and in deed. Use visual support around the school, verbal support in and out of class, and affective support to let all children know that their first/home language has value. 2. Encourage children to share together their different languages, and to understand how they are different and similar. 3. Show through positive modeling that all languages are of equal value in the school environment, even if one is more “useful” for school purposes. In particular, let children use their first/home languages together to help them learn content and ensure understanding when they are still learning the school language. 4. Involve parents. Children who have parents who speak another language often believe that this is something to be ashamed of – how many minority parents hear from their child “Mummy, please don’t speak to me in x-language at school – it’s embarrassing!”. Bring parents into the school to read in their language to whole classes, to demonstrate that other languages are also used for communication and literacy, and to help the monolingual children better understand the position of the children who are language learners. 5. Never make language a source of punishment. Languages – all languages – are important and useful and beautiful. Punishing a child for their language use is not only unfair, it is also cruel, and so very detrimental to their overall development in and out of school. There are many positive ways to encourage children to use the school language without being punitive about their own language. If you have a bi/multilingual child in a mainly monolingual school, have a think about how your school thinks about bilingualism. Are they promoting “additive bilingualism” (we think it is great you speak another language and we want to *add* the school language to this) or “subtractive bilingualism” (it doesn’t matter that you speak another language, here only the school language is important”). And if you come to the conclusion that they are not as “additive” as they should be, I challenge you to make this your personal project for the next school year!